TenkoFX review - Is it the right choice of Forex broker in 2017? 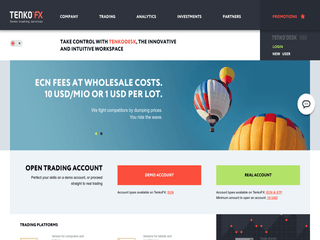 A trusted and popular brokerage house with a fame for one-of-a-kind intuitive services for trading and superb client relations, TenkoFX is definitely one of your top-notch selections of Forex brokers. The reliability and responsiveness of its trading products and the paramount quality of its support infrastructure are what really distinguish the enterprise from the many others in the competitive Forex niche. TenkoFX underpins its front-line technology for trading with a professional team of adept managers who are dedicated to addressing even the most fastidious needs of each and every partner and customer – irrespective of his or her preferences. Some of the magnificent benefits of choosing TenkoFX are Straight Through Processing (STP), Level II Pricing, and Extensive Toolkit. Rest assured that with the firm’s tight security measure and latest technologies for preserving funds at world’s most reputable and largest banking entities, your cash will be intact at all times. TenkoFX is domiciled in Belize where the local International Financial Services Commission is charged with closely monitoring its financial activities. TenkoFX has a selection of two (2) trading accounts that are armed with a host of amazing features. Let’s start our trading information journey by reviewing the STP account. Its minimum initial deposit is solely $10. It is characterised by a mark-up pricing and a commission-free trading. The maximum leverage of the STP account is up to 500:1 while the Margin Call and the Stop Out levels are 100% and 50% respectively. The minimum amount of margin commences at $2 while market depth is not available. Algo-trading, news trading, scalping, and hedging are all allowed at this account. Hedging, however, is characterised by a 50% margin release. The ECN/PAMM account is the second option at TenkoFX whose minimum deposit for initiating the trading account is $100. The asset classes with the ECN/PAMM account are natural gas, currencies, crude oil, Silver & gold, and stock indices. The account’s max leverage is up to 200:1, while its Margin Call and Stop Out levels are 100% and 50% respectively (same as the STP account). The minimum margin of the ECN/PAMM account, nonetheless, begins at $5. News trading, scalping, hedging (50% margin release), and algo-trading are all allowed, too. Both accounts derive fantastic benefits from no-requotes, market execution, slippage, and variable spreads. Their maximum lots are set to 1,000 while the minimum lots are 0.01 for currencies and 0.1 for indices. Both accounts can be commenced in USD, RUB, and EUR but they cannot be swap-free which is unfortunate for Muslim traders. A good thing is that there are demonstration accounts that are wonderful for newbie investors. Both the STP and the ECN/PAMM accounts are packed with wondrous features and are both available for world’s most versatile and reliable trading platform – the MT4. TenkoFX’s MetaTrader 4 offers passionate investors with the entire flexibility to deeply analyse the behaviour and volatility of markets thanks to the swarm of tools, including trading signals, executions for trading, tools for technical analysis, and the ability to programme your own automated trading algorithms that are MQL-based. Some of MetaTrader 4’s most distinctive features encompass an integrated MQL 4 programming language that is perfect for making individual indicators, EAs (expert advisors), as well as scripts for automated trading. In addition, there are flexible charts, an access to history logs (which is super handy), and a real-time data feed. The user-friendly, yet elegant, interface and the high levels of efficiency, security, and flexibility come next to a broad array of newsfeeds and analytical tools, and all types of orders are allowed at TenkoFX’s MT4. Keep in mind that downloading the platform is necessitated to start placing your initial investments. A financial conglomerate is nothing without exceptional security measures in place. TenkoFX assures each account holder that every single detail of their security infrastructure has been crafted to address the highest standards for privacy and safety. The security technology the Forex enterprise utilises is extremely reliable and segregated accounts are kept in major banking entities. All data reporting and settlements are moderated by a party that’s independent of the company’s activities in order to provide extra security. The FX company is domiciled in Belize and the country’s financial entity – the International Financial Services Commission – is charged with its oversight. TenkoFX is not only safe and secure to work with but it’s also a great pleasure contacting support for any issues that may present a temporary obstacle. Rest assured that TenkoFX’s professional team of experts will handle the issue with attentiveness and a friendly attitude. The ways to reach them out are via live help, several phone lines, and a couple of e-mails. The firm’s website is elegant and is accessible in English, Farsi, Indonesian, Russian, and Chinese. TenkoFX is equipped with a grand variety of deposit options to stack up your account. First of all, there are debit and credit cards deposits via China UnionPay, MasterCard, and VISA, but for the last two, not all countries are supported, unfortunately. There are also e-wallets, such as Qiwi, Skrill, Fasapay, NETELLER, Perfect Money, and Bitcoin (one of the very few brokers that offers virtual currencies is TenkoFX). All deposit options are instantaneous save for Qiwi which is done within 1 day. Withdrawals at TenkoFX are done via the same way as deposits are executed. All withdrawals materialise in 3 hours. You should bear in mind that almost all deposits and withdrawals are charged with fees that vary from 0.5% to 1.5%. For more information, you can consult with TenkoFX’s deposit and withdrawal page. TenkoFX is not only committed to growing exponentially but also to pampering its new-fangled and loyal customers. Every new account derives good benefit from a $30 welcome bonus. In addition, there is the ECN gravity promotion that necessitates $1,000 for which you will receive 3 months of trading defined by liquidity costs of just $10 per one million. This barely amounts to a 0.001% (1 way) transaction cost or 1 base currency unit per 1 lot. To qualify for this promotion, an investor is required to launch an ECN account with at least $1,000 and then send an e-mail to the support centre of the company with the subject “ECN Gravity”. Unfortunately, there is no “Refer a Friend” option which is quite surprising as most forex brokerage houses offer that.